Last week at my Simply Sisterhood meeting I was given the bouquet to take home. It has opened up things for me that I hadn't dreamt of. At first I was just appreciating how beautiful they looked - carnations, Alstromeria or Peruvian lilies and larger pink unscented lilies. I was fascinated by the green carnation in particulare and remembered that it was associated with Oscar Wilde. So onto Google. It turns out that a green carnation was a symbol for Ireland particualrly for St. Patrick's Day. They aren't always dyed but are a variety that can be grown. Then I noticed that there is an Oxfore University tradition, that apparently originated as recently as the 1990's, of wearing carnations. 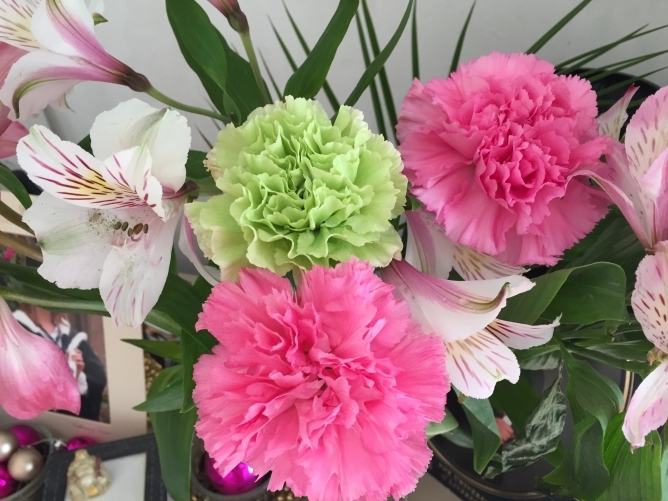 For the first exam it is white, then for most of the exams it is pink, until the final exam when a red carnation is worn. The legend is that if you start with a white one and keep it in a red inkwell over the course of the exams it will gradually turn red. This shocked and surprised me. Why? Because my daughter went to Oxford in 2004-8 and she hadn't mentioned this. I'm very proud that both my children are very independent and like me, although they wouldn't call it this, they too are following their bliss. But this hit me that I can miss out on a detail like this in their lives. I wanted to make sure that I wasn't a mum who needed to have every detail of their lives related to them - but this made me feel I want to be closer and more connected. I messaged them and my son, who is in Singapore was the first to respond. He rang me and said he remembered the carnations in Oxford because he went their to stay with his sister and celebrate with her. This started another conversation because my grandfather, a miner, had an allotment so big it was more of a smallholding with hens and huge greenhouses for his tomatoes and he grew prize winning leeks. His leeks even won first prize in the News of the World Leek Competition. He also grew pink, carnations and would sport one in his buttonhole, wrapped carefully in damp cotton wool and silver paper to keep it fresh. Yesterday I went to a meeting of my Simply Sisterhood group. We had decided to have a celebratory spa afternoon so our inspiring leader, Louise Cardon, arranged the whole day at Ramside Hall, Durham. As we sat sipping our drinks by the pool I realised how at home in my body I now am. I'm quite at ease in my bikini or tankini - chosen as I like the feel of the water on my skin, especially in the sea. It was a cold, icy February day yet even going into the outdoor hot tub in the rain was fun. The contrast in temperature, the heat of the pool and the cold refreshing rain on my face is a beautifully sensual pleasure. Even those hesitant of going outside into the cold rain enjoyed it! When everyone started taking photos I asked Louise to take a full length shot of me - for I am loving how my body feels. Now I enjoy and appreciate my body. Over the years I've had different schedules and eating routines that were always from someone else. I decided over ten years ago that for me happiness is enjoying the food I eat and appreciating my body and all that it does for me. Every thing that can be eaten someone has an opinion about. I decided that I wasn't going to label food: good/bad; healthy/unhealthy; naughty/nice; treat/indulgence. I would eat what my body said 'yum' to. This feels so so so much better. My tastes have changed and now food tastes so much more delicious! I'm appreciating things in the past that I never enjoyed - 8 years ago I discovered I now enjoy coffee after a lifetime of not liking tea or coffee. At first my mind was trying to dictate: 'You can't drink that you've never liked it. It's got caffeine in, it's not good for you.' However my taste buds and my body said differently. Sometimes I don't fancy coffee for a week or a few days, and I don't feel addicted, I find the whole experience of having a beautiful cup to drink from is part of it. It's a pleasurable experience. And I love my belly. This belly has nurtured and grown two amazing babies and also feels good to me. I'm not saying I will stay this shape forever, however this shape feels perfect for me right here, right now. I love going sea swimming and my body loves the water - and it enjoys even the winter temperatures of the North Sea. Yet I don't feel I need to compete or challenge it. The past two weeks I've not fancied going into the water so I haven't. More and more it feels like my body is thanking me as I listen to what it wants and I now tell it how much I appreciate it. It is so liberating! Thank you my physical apparatus - and thank you for those moments when I honestly appreciate how fabulous and beautiful you feel. 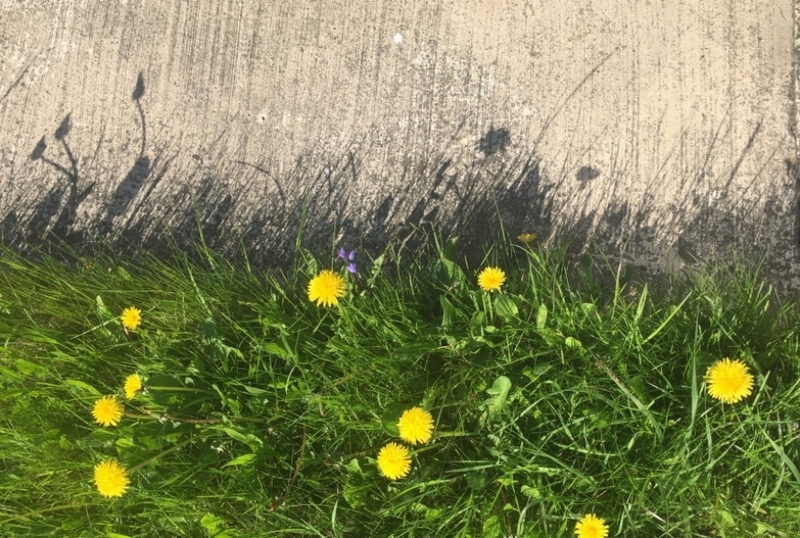 Dandelion Shadows and Avengers: Infinity War. Today I sat in the garden enjoying the sun and the dandelions. The shadows created on the path were beautiful too, so much so that I photographed them for my banner. Then I realised that while I had appreciated the golden dandelions, it was only when I saw their shadows that I decided to photograph them. I've typed this opening paragraph three times and it has disappeared - until I made that realisation! I love laughing at how long it sometimes takes to get something! So it's when we see the contrast, the shadow that we appreciate the full technicolour version of things that we have in life. I had been beating myself up for not cutting the grass because I was wondering what people will think. The shadows put an end to that - I love to see the dandelions and the different grasses they bring me such pleasure. So thank you nature for that wonderful gift today. So how does this relate to writing and filmmaking? This week I've been to see Avengers: Infinity War and my friend, her son and I all agree what makes this so good is the humour- the light and shade. So take a tip from the dandelion shadows and the Avengers and use both! Today I was in the garden and noticed how beautiful the shadows of the dandelions are against the concrete path. I'm so pleased I haven't cut them - I almost did, thinking people might think me lazy! Instead I have pleased myself by leaving them to create a blaze of gold in my front garden. The bees are enjoying them too. Today I left at 8a.m. for a Damsels in Success meeting. I was feeling tired and all I could think was I wanted to nap. My friend drove us to the station - and she was feeling unwell and nauseous so by the time I had carried her suitcase through the rain the short distance to our Metro stop I was feeling much much more awake! We had both had a very cake-filled Easter. She had made a gorgeous lemon cake iced with gold eggs and my sister-in-law had made a delicious Victoria sponge cake - both indulgently filled with cream. Usually when people ask what we do at Damsels (which most read or repeat as Damsels in Distress rather than Damsels in Success) I say it's a women's support network and we sing, dance and eat cake. Today brought home the importance of the cake element for me. I didn't have any cake this meeting - still cake satisfied from the Easter weekend. Plus I had planned to take my mother out for afternoon tea at a little tearoom overlooking the park near her home. When we arrived at the tea shop I ordered afternoon tea, but she asked what soup it was and immediately ordered that. I asked if she'd like the afternoon tea after the soup but she said she only wanted an order of one of the sandwiches that was only on the afternoon tea menu, which they said they could make up for her. Until this point my lovely mam had been in complaining mode - that she feels anxious, she isn't in the moment etc. My afternoon tea of a cake stand with a sandwich, scone with clotted cream and jam, and a selection of delicious looking cakes arrived. Her eyes lit up. 'I didn't know they did afternoon tea!' She exclaimed. It was like a wake up call. When her soup arrived she started to say she wished she had ordered the afternoon tea. But I said there are plenty cakes for us to share, so we did. Talking about what they were and the flavours. The sandwich she had had made up we took home in a bag. The point of this is the cakes were so delightful to look at: 2 cigar rolls of meringue infused with raspberry, a pistachio meringue, flapjack, lemon cheesecake and more they excited both of us. The afternoon then turned into fun for us both. We were admiring the daffodils and when we went out into the park found tiny fairy doors, beautifully decorated and surrounded by wooden toadstools and tulips, nestling at the base of some of the trees. When we returned to her home we began looking at the kitchen units and bench she had picked out a year ago. Then I started talking of going to visit my son in Singapore. I was talking of the itinerary he has started planning and she was saying that she wished she was up to going. I said 'Why don't you come with me?' For the first time she began to talk with enthusiasm about going with me. In some ways it doesn't matter whether or not we do this trip. It was such fun talking about it, fantasising about spending time with Jack. That he wants her to stay at the Raffles Hotel. Then she exclaimed - I was going to ask if you wanted to have your hair done. I thought we could go to the hairdresser's and maybe have our nails done. So we are planning that for next week. And my mam is booking it! This is such a transformation from my call this morning when she said, it's raining, do you really want to come? Now she is looking forward planning trips for pleasure. I love that the trigger was cake - for to me that symbolises being good to yourself, allowing yourself to enjoy life, so now I'm having my cake and eating it! Happy Easter week. Yesterday I had a 1-2-1 session with Damsels in Success creatore Lucie Bradbury. And the vibrational shift was - let's just say I FELT it. A year ago when we had a Damsels session on the roles in our lives I found mine have changed quite significantly. The roles of Wife and Mum are effectively obsolete. My children are now ages 31 and 30 and such amazing adults that I feel able to celebrate a job well done as their mother. I will always be their mother, however that role is very different now. So in this Golden Age that I find myself in what ARE my roles? The one that got me tingling and stepping up to the plate was when I found myself declaring I am a film producer. In the past when asked what I do I've usually replied, 'I'm a writer.' Now I tell people I'm following my bliss - and this is definitely more authentic as people, including my daughter and my son seem to get this. So rather than saying I'm writing I started telling myself ~ I'm in my Studio ~ I've got so used to saying this that I automatically WhatsApped the Bairns - my son set up a Mam and the Bairns group - and said I was coming back to my Studio. And they get it! It feels great to have created this and covers all the creative work that I'm doing. I hesitated before typing ~work~ as this has been a word I've avoided using in relation to creative projects. My musician housemate when I asked her if she was working that day replied 'I don't work, I play.' Yet typing ~work~ just now felt very different. For me now in following my bliss my work is inspired, rather than coming from motivation ~ doing things from a place of fear ~ I now ~work~ in an inspired, effortless, flowing way. So this morning I was in the Studio writing. By a rough calculation it must have been for 4 hours in everyday time yet in inspired time it was for a few minutes! It's All About the Timing! To me time is multi-layered, multi-dimensional, and I appreciate that I have learnt to play with time, to stretch it to suit me so now instead of working to deadlines I create lifelines of fun time. These take me to a place where work becomes effortless. I love working from a place of joy. I also love when I notice that I may be struggling with a task that I can become mistress of my task! When I feel 'effort' I can change it - sometimes with a change of perspective mentally or physically. My favourite way is to walk by the sea. When I lived in the town in my last year there I was going to the beach three or four times a week. Now I live in the north east of England on the North Sea. With this climate it isn't often that I can lie on the beach in the sun! However I have found some brilliant cafes and restaurants where even on the windiest, rainiest, chilliest days I can enoy the sea while sipping a hot drink! I love walking along the beach too and this helped me manifest my first home by the sea - I put out the thought that the spot where I was standing with the sea on one hand and an old windmill on the other would be a great place to live. I didn't think of it as a place for myself, just that generally it would be a great place to live. Within four months I found I was living there with a view of the windmill from my bedroom! I love that I had to moved from there last February and now have a home of my own with a view of the harbour and the sea. I love that when my friend had to move she moved to round the corner from me! How does it get even better than this? I love opening up to possibilities and seeing how the Universe delivers things far better than I even imagined!!! So this year my vision board has focussed on how I want to FEEL!!! 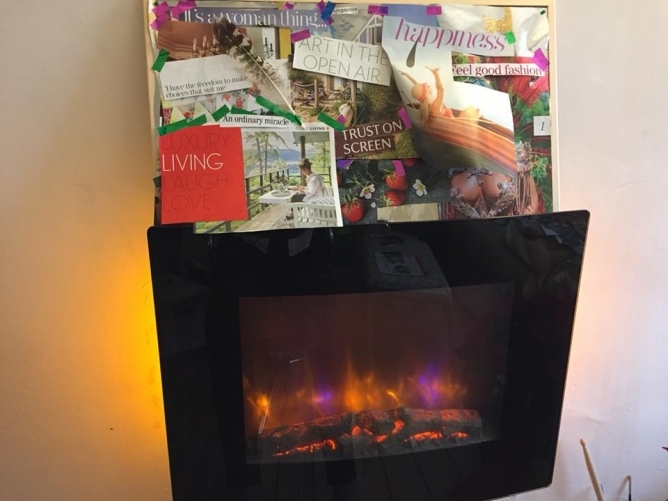 I've even placed it above my flickering image fireplace to 'fuel' my vision! I had intended it for my bedroom but for the moment this feels the right place for it. I love the feeling of being ALIVE and LIVING life. Also: I HAVE THE FREEDON TO MAKE CHOICES THAT SUIT ME. FEEL GOOD FASHION - I love that I decluttered my underwear drawer of all uncomfortable undies and have bought FEEL GOOD underwear! AN ORDINARY MIRACLE - I've combined these last two phrases for that is what I have found. This time last year I was renting a room yet my FEELING was THIS IS MY PLACE and when I had to leave I manifested an ordinary miracle of a one bedroom bungalow with a private south facing front garden and a beautiful huge communal garden and allotment at the back!